Figure 2. Calculated band structure (from Fig. 4 in this Nature Physics article; printed with author's permission) showing the before and after energy levels of the system. The inset shows an example of a trivial (non-topological) insulating state shows a large gap. In this example, the system can be transformed into a topological insulator. Lines appear through the insulating region which can be thought of as pathways ("edge states") for the electron to move from the lower to upper level. 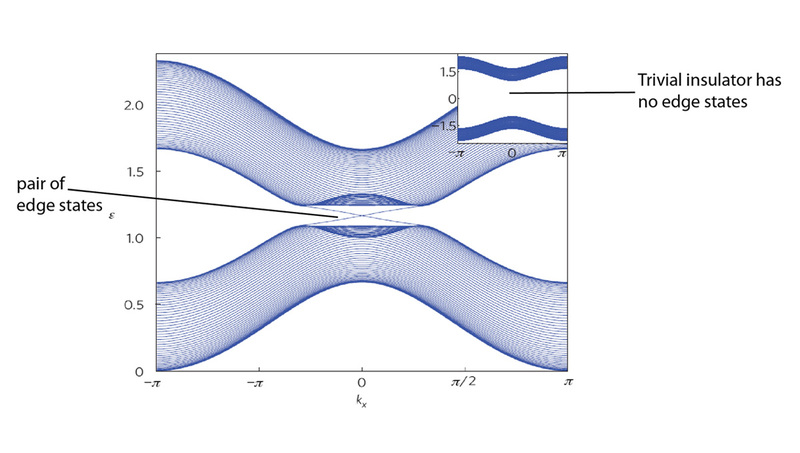 Researchers are excited about topological insulators because they can exhibit this type of physics, normally observed only under extreme conditions, without the large external magnetic field. Scientists believe that this is partially due to the enhanced relationship between the electron’s spin, (which can be thought of as a tiny bar magnet), and an induced internal magnetic field. In other words, an electron lives in a natural environment of electric fields, which forces the charged particle to move with some velocity. Due to the laws of electromagnetism, this motion gives rise to a magnetic field, which can affect the behavior of the electron (so-called spin-orbit coupling). When this internal magnetic field is sufficiently large, the situation is similar to that of the externally applied field: the material may be insulating in the bulk and conduct electricity along the edges. In the case of topological insulators, this is called the spin quantum Hall effect. A distinctive characteristic of topological insulators as compared to the conventional quantum Hall states is that their edge states always occur in counter-propagating pairs. Scientists say that this is due to time-reversal invariance, which requires that the behavior of the system moving forward in time must be identical to that moving backwards in time. Even though the arrow of time matters in everyday life, one can imagine what time-reversal symmetry means by looking at billiard balls moving on a pool table. Without knowing when the cue ball set the other balls in motion, you may not necessarily know whether you were seeing the events run forward or in reverse. In the case of the edge states, this symmetry means that events (and likewise, the conduction channels) in the topological insulator have no preference for a particular direction of time, forwards or backwards. Thus, any feature of the time-reversal-invariant system is bound to have its time-reversed partner, and this yields pairs of oppositely traveling edge states that always go hand-in-hand.